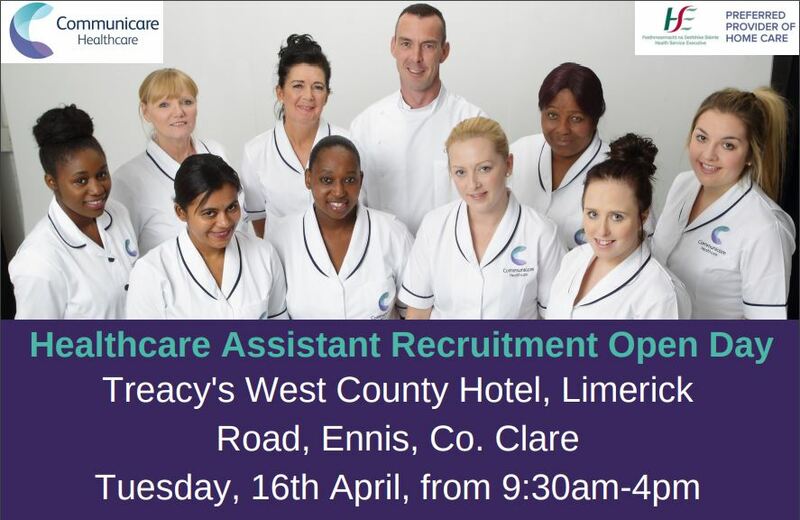 We are holding a recruitment open day for Healthcare Assistants on Tuesday 16th of April 2019 in Treacy’s West County Hotel, Limerick Road, Ennis, Co. Clare from 9:30am-4pm. Whether you are currently training to become a HCA or have been working in the industry for many years, we would love the opportunity to speak to you. No appointment necessary, just show up between 9:30am-4pm and speak to one of our staff members. We’re looking for enthusiastic and dedicated people to join our team of healthcare professionals. Communicare has some fantastic opportunities for Healthcare Assistants in Limerick and Clare – We offer fantastic rates of pay, flexible hours, 24 hour support and a full training program.